Seoul, South Korea - On a December day in 1950, at the height of civilian evacuations during the Korean War, Lee Geum Shim managed to carry her newborn daughter onto a ship at the port of Hungnam. But as she turned around, she realised that amid the chaos her husband and four-year-old son had failed to board the ship, the last one to set sail for South Korea as part of the Hungnam evacuation. Shim realised it too late. Now 94, she doesn't remember what her son looked like. But, unlike the majority of families separated by the 1950-1953 fighting, Shim will get a chance to meet him again after 68 years. Together with her daughter, she is one of 93 South Koreans who will visit the North later this month for a family reunion, the first such event in almost three years. [post_ads]"I'm not sure if I'll be able to recognise him," Shim told Al Jazeera. "I don't even remember his face when he was four. I can't believe I will be meeting him. It feels like a dream." A total of 88 people from the North will also get a chance to meet their families in the South during the six-day event, which starts on August 20 and takes place at Mt Kumgang north of the border. The last reunion took place in October 2015, with the long break being down to the frosty relations between the two Koreas with threats of war looming over the peninsula late last year. However, relations have since thawed - a historic meeting between leaders from both sides in April was preceded by a political and sports delegation visiting Seoul and Pyeongchang for the Winter Olympics. In the past, the family reunions would be the relatives' first contact since being separated. Given the large pool of applicants and the limited number of spaces, it would also be their last. According to South Korea's unification ministry, more than 132,000 people applied for the reunion which was cut down to 68. Shim is not the oldest on the list this year - there are two people aged 100 or above. Since 1988, more than 132,000 people have registered with the Red Cross in South Korea for the reunion programme. Over half of them have since died. With the reunion event an irregular one and people being selected randomly, the lucky few do get to meet family one last time. Unlike Shim, Lee Soo-Nam remembers what his brother looked like when he last saw him. 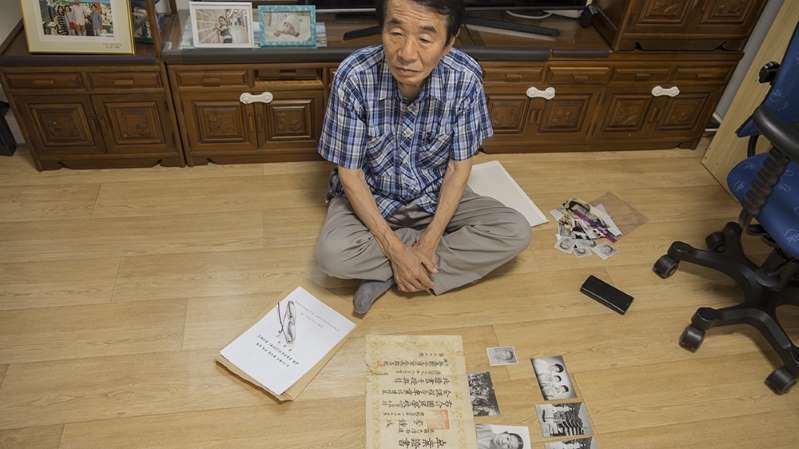 It was August 1950, during the Korean War, and the family was getting ready to go to the countryside when his brother was dragged away by North Korean soldiers who occupied Seoul briefly at that time. Back then, it was routine for the North Koreans to take away young men, according to Soo-Nam, and use them as fighters in the war. Soo-nam registered for the reunion 30 years ago and could not quite believe his luck when the phone rang and the Red Cross official told him his brother was alive. "We all thought my brother died in the war. And if he was lucky enough to survive, I never thought I'd be able to see him again considering our ages now," said Soo-nam at his house in Itaewon, an area of Seoul he was born in and still lives in. Soo-nam spread old family photos in front of him as he recalled his younger days. He then pulled out a high school certificate from an envelope. "This is my brother's high-school certificate. I have kept it as his memory as I never thought I'd be able to see him again," added Soo-nam as he moved his hands on the certificate, feeling the paper as he paused and looked out of the door, deep in his thoughts. "When I got that call, I asked the person if he was joking. I didn't talk about this with anyone. I kept it a secret. I couldn't believe my brother was alive and that I'd get to meet him. It was like a dream. But I already feel sad because this meeting would probably be the last time I see him." Almost 36,000 out of the 57,009 people registered with the Red Cross who are still alive are aged 80 and above. More than 12,000 are over 90. While Shim and Soo-nam were lucky enough to be selected, for thousands of other Koreans, time is running out after missing out on being shortlisted once again. "I signed up for a reunion 30 years ago but have yet to be picked for one," 80-year-old Nam Gyu-hyeong had said earlier this year. "While I would still like to be part of a reunion, I think the Red Cross and the authorities should've done something earlier. For me, there isn't much time left. Five of the nine people I fled North Korea with are dead already." The reunions and humanitarian diplomacy depends on the general trend of North-South relations, according to the Korean Red Cross' Inter-Korean Cooperation. "Since 2008, there have been fewer face-to-face and video reunions," an official said. "The figures of separated families here in South Korea are those who have voluntarily registered for the reunions. The actual number is quite different. A lot of individuals didn't register because they don't want to endanger the lives of their families in the North." For people from either side, the reunion last for three days only. They will be prepped by authorities on both sides. Analysts say authorities in the North tell participants to ask for food rations and money. Lee Shi Deuk, 95, says he is happy to oblige as he prepared to head out for some shopping before he meets his niece and nephews later this month. "I'm preparing gifts for them but the suitcase I can carry is too small for everything that I want to give," said Deuk. "I just want to thank them for taking care of my father and sisters. "Since last April, my health has deteriorated. Perhaps, I'm getting closer to death and this meeting has come at a good time."